Home Streams MrCreteture’s DiRT Rally Giveaway Stream! 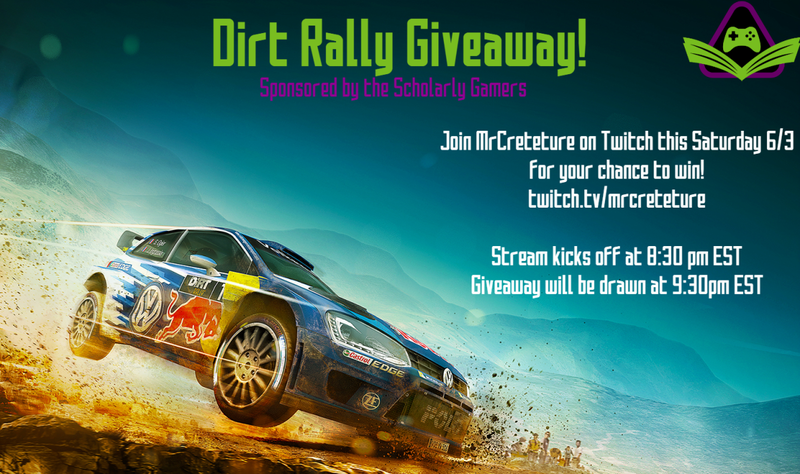 MrCreteture’s DiRT Rally Giveaway Stream! Scholarly Gamers’ community manager MrCreteture is giving away a PC copy of DiRT Rally, developed and published by Codemasters!Starting off the three/four hour (or longer) stream at 8:30pm EST, MrCreteture will be delving into the rally car racing game to show off the many cars, stages, tracks, weather conditions, and more in this feature-packed title. Welcome to DiRT Rally – a new world of DiRT. A pure expression of rally, the pinnacle of off-road motor racing and it begins now, in Early Access, with regular free updates including new locations, new game modes and new vehicles. As always with Scholarly Gamers giveaways, be respectful to one another and remember that the giveaways are for fun; we plan to hold many of them as we continue to build momentum within the community. Follow us on Facebook and Twitter for more information on giveaways, intellectual features, and day-to-day news of the gaming world. Gamer, Ninja Warrior, Traceur, and Father of two. Video Game passion ignited thanks to the 1995 SNES classic "Chrono Trigger". Still an avid gamer, playing mostly RPGS, however likes to dip into other genre's from time to time.